Another great use for apple that have lost their crunch is to make a batch of Apple Pie muffins. The recipe comes from Canadian Living's Best Muffins and More publication and are a hit every time I make them. They are moist, studded with apple chunks and topped off with a crunchy nut streusel. From the sidebar write-up in the book, there is some additional historical information about this yummy muffin. "When Canadian Living Test Kitchen manager Daphna Rabinovitch was pastry chef at Toronto's David Wood Food Shop, these crusty-topped, apple-filled muffins were one of her best sellers." I have no doubt about that! These muffins can be enjoyed any time and can be frozen and eaten later. Try one warm with butter - they're great! What a beautiful picture, Jen! And those apples look and sound incredible. I can almost smell them! These combine two of the best foods ever – pie and muffins! I can almost smell them too. I found your blog through Sweet Pleasure-- and I love it! 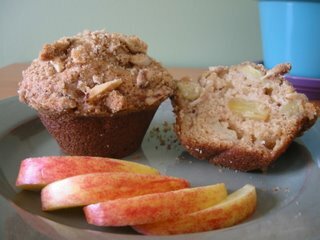 These are the kind of simple muffins I love, and their practical usage of not so crunchy apples is the kind of dual purpose baking that I love. From our Kitchen - They do make the kitchen smell wonderful while they're baking!